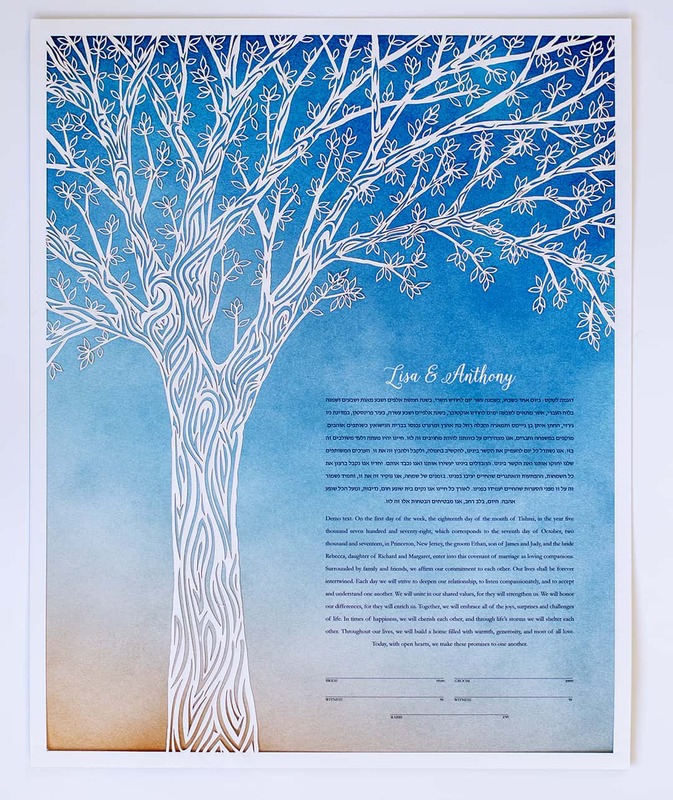 The Tree of Life Paper Cut Ketubah features a delicate and ornate paper cut tree on top of the background color of your choice. 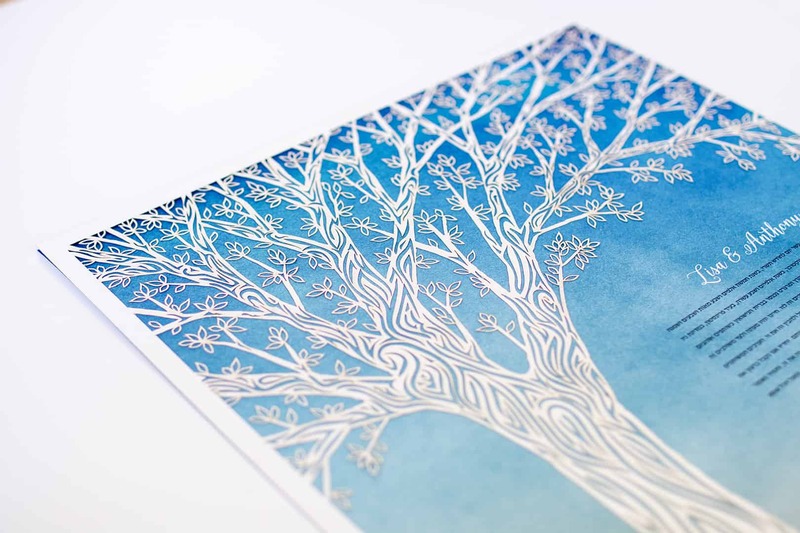 This fine art ketubah is part of the recently launched paper cut ketubah collection here at Ink with Intent. 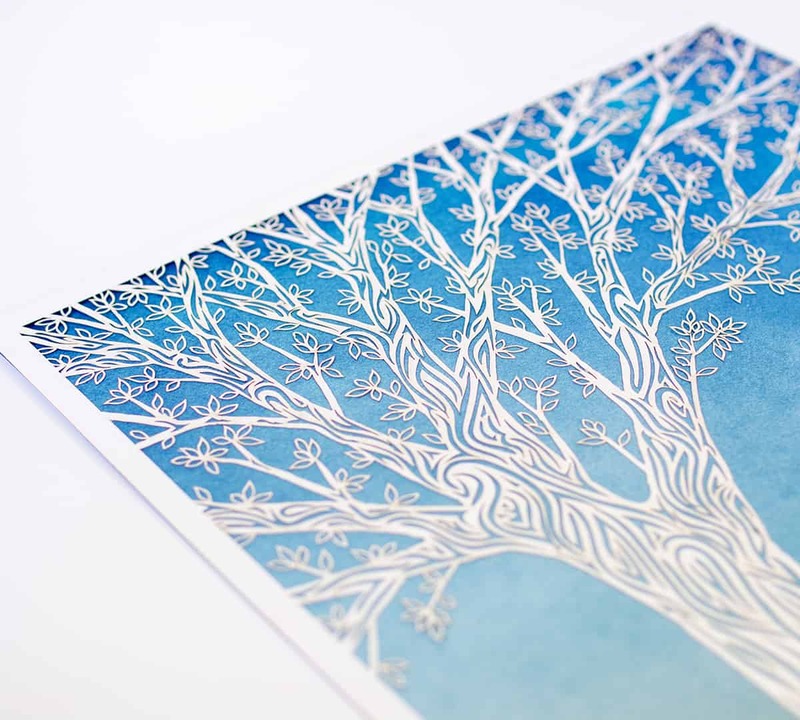 Each fine art paper cut is hand-produced using laser technology in our Vermont studio. 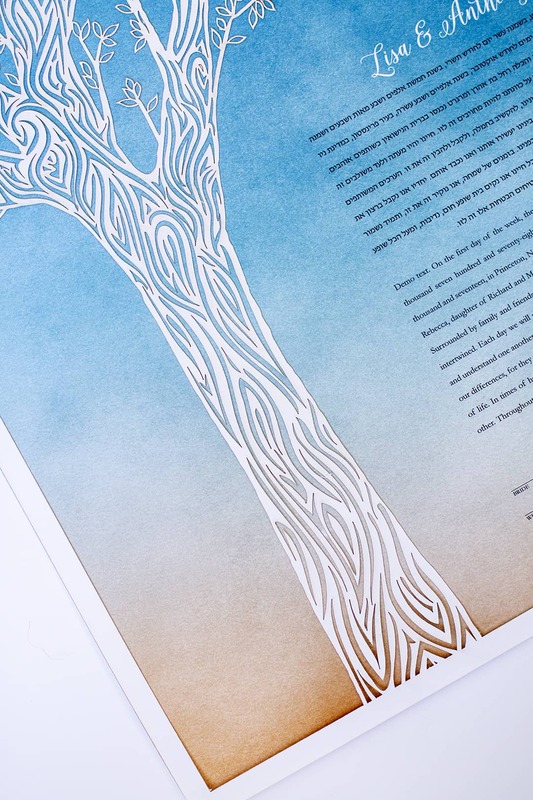 This paper cut ketubah consists of two layers. 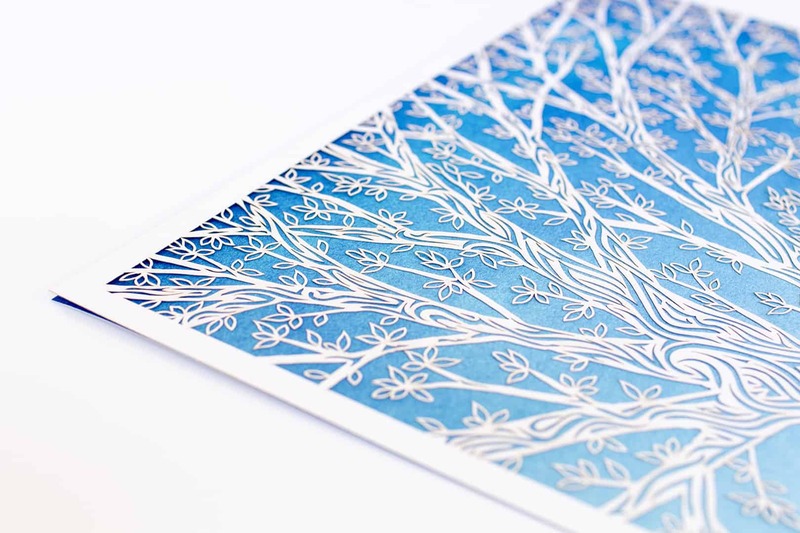 The fine art paper cut layer on top and a second layer which is a giclee print containing your custom background color and text. 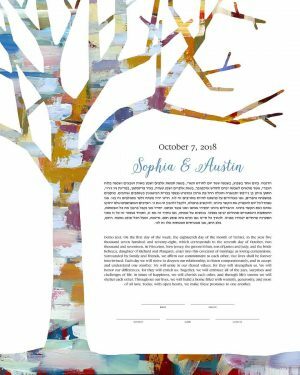 The two layers are carefully affixed together to produce a one-of-a-kind piece of artwork to sign on your wedding day.  Click here to read all Hebrew text options.  Click here to read all English text options. 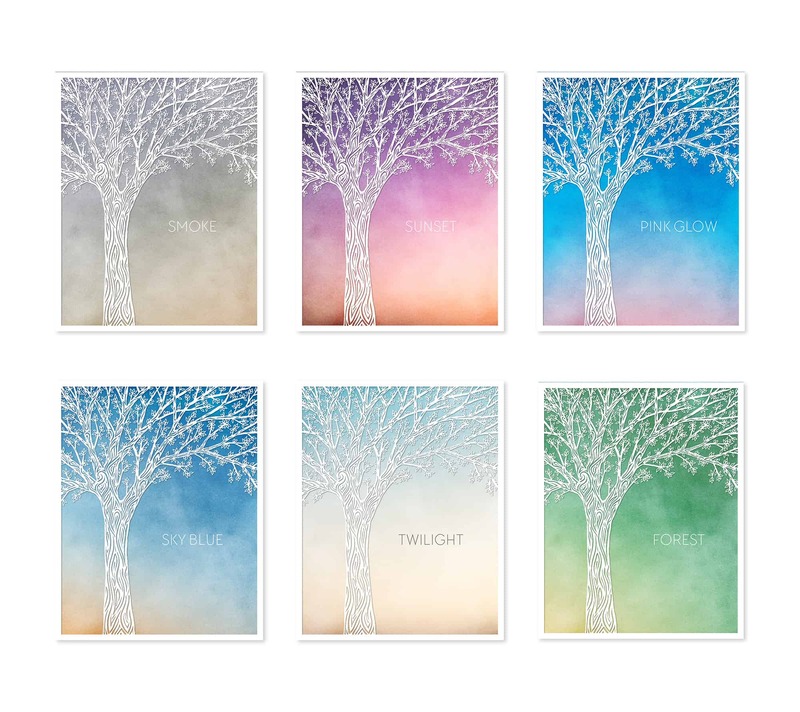 Would you like to add a custom frame to your artwork? 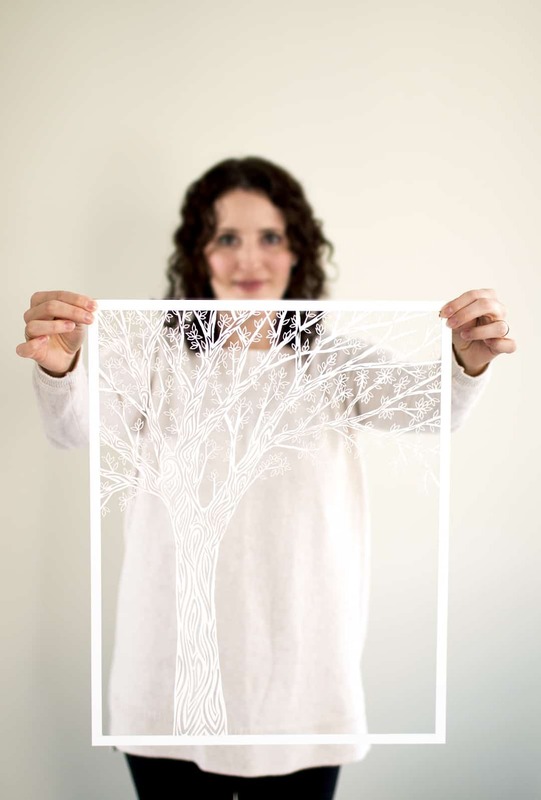 Learn more about framing and see photos of all frame options. 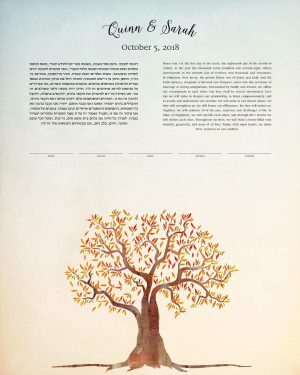 This option is only available for shipment within the U.S.A.
Like all our ketubah designs, this one is personalized with your choice of texts, headlines, fonts, signature lines, colors and more. You can select one of our pre-written texts, or we can have your custom text translated into Hebrew. We work with a team of certified, professional translators from Israel to ensure your translated Hebrew text is accurate.  Once we receive your order and preferences, we will create a digital proof of your ketubah and send it to you for approval.  Once it has been approved, we will have your custom text professionally printed using the giclee method. 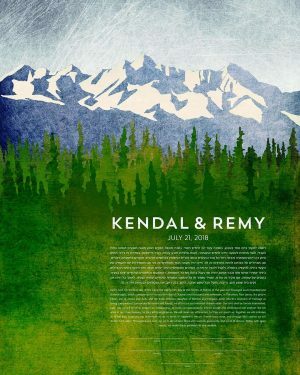 Your fine art ketubah will then be carefully assembled in our Vermont studio and then shipped to your door. Unless you are doing rush service, please allow 6 weeks for the full process of ordering and receiving your finished paper cut ketubah. Once it’s been assembled, we will ship it to you in secure packaging with tracking information. 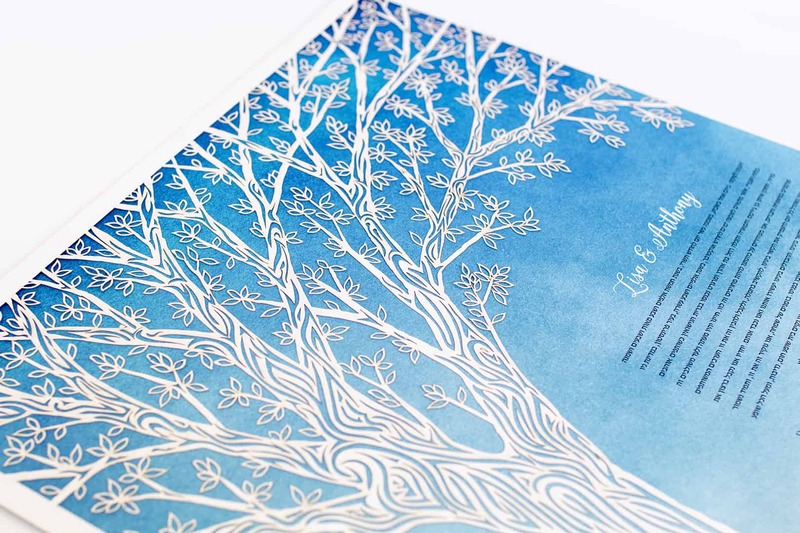 Please do not hesitate to contact us with any questions regarding the Tree of Life Paper Cut Ketubah.